Pay-per-click advertising (PPC) can be an intimidating process for those new to digital advertising. Figuring out what to spend, what to write and who to target are only the first steps to planning a PPC strategy. Once you get yourself set up on Google AdWords and run a few ads, you'll want to start optimizing those ads to get more conversions and start making more money, right? If you haven't setup your Google AdWords account properly before you start optimizing it you'll run into a confusing mess of problems. From what I've experienced, organizing your ad groups properly is the key to effectively setting yourself up to start optimizing your conversion rate. In this article I'll share with you a couple ways your can organize your Google Ad groups for simple optimization. 1-5 keywords per ad group. Best practices state not to have more than 20 keywords per ad group to avoid too much confusion. But in this case, keep it simple and try to only have 1-5 keywords per ad group. 2-3 ads to test against each other for performance. As you begin to get clicks on your ads you'll want to stop whichever ones are performing poorly. 1 landing page for the highest quality score. The better your ad text matches your landing page, the higher your quality score, and the more your ad will get served on Google AdWords. The trick to receiving a higher ad quality score is to have less keywords per ad group combined with a landing page that perfectly matches the ad. It does mean more work for you honestly, but it helps to have a dedicated landing page for each ad group for an optimal ad experience for your audience. Broad Match will serve your ads to any keywords that are broadly related. It casts a wide net for your keywords and matches to anything Google deems related to your keyword. It is a great way to discover more keywords that your target audience is searching for but can quickly spend your budget on low-intent keywords — so keep a close eye on them. 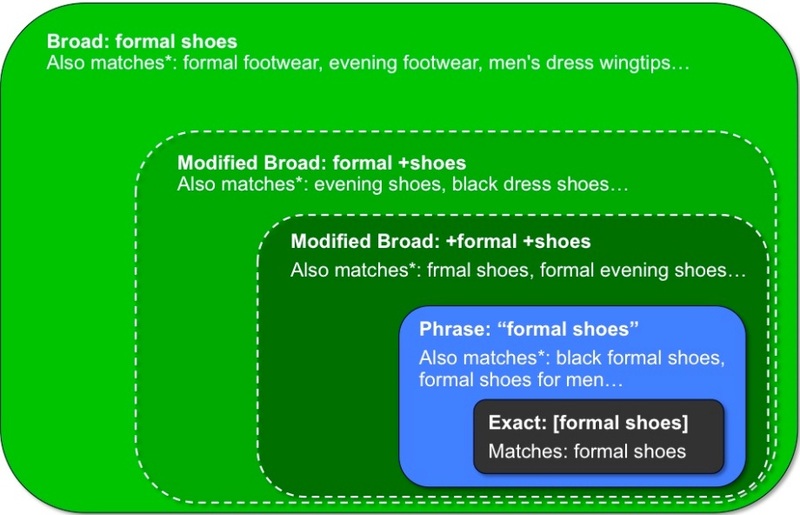 Phrase Match will match all queries that include the entire phrase, in the exact order. If you have phrases that you know you want to match for, phrase match is perfect. It will still match for queries with extra keywords at the beginning and end. Exact Match will only match with queries that are exact. These are queries that you know for sure that you want to match with. 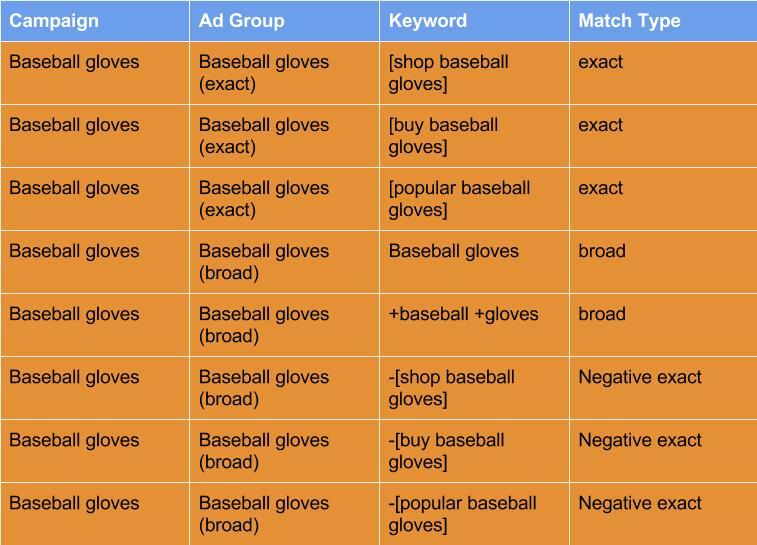 Organizing your ad groups by match type is a great way to start off a new campaign. 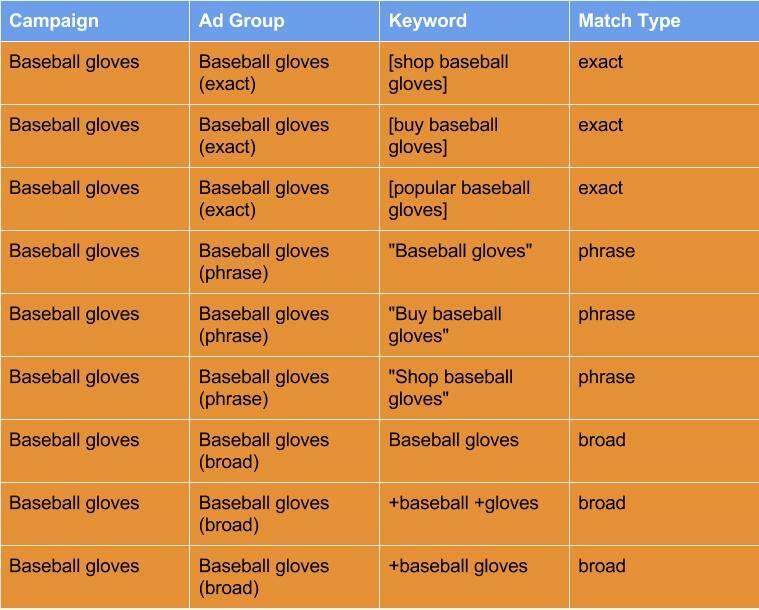 By organizing your ad groups by the keywords you know you want to bid on (exact match) and the phrases and keywords you think you'd like to bid on (phrase and broad match) you'll be able to see what keywords are triggering your ads. Then you can add those new suggestions into your exact match group and bid for them once they prove to be profitable. One efficient and powerful method of organizing your keywords is by top performers. The key strategy here is to target only the exact keywords you want in your exact keyword match ad group and discover other well-performing keywords in the other broad match ad group. To optimize your keywords you'll want to consistently check the search terms your ads are showing for in your broad match ad group and add them into your exact match ad group if they show promise. Then you'll add those exact match keywords into your broad match ad group as negative keywords so that they only show for your exact match ad group. This way you won't be wasting your budget in both of the ad groups by entering the exact amount you'd like to spend on the high intent keywords. This method works well because it structures your keywords into only two ad groups. It eliminates the need for you to go searching through several ad groups to find the poor performers. The benefits are similar to the previous match type organization but it offers more flexibility. It'll save you time from having to create new ad groups over and over, and just add the exact terms you want to bid on into top performer ad groups. Think of this method of organization like owning both a major and minor league sports team. When your players (broad match keywords) in the minor leagues are performing well, you'll move them up to the major league (exact match keywords). Ideally you'll want to create new ad groups and landing pages for each keyword you move up to the majors to precisely control your bid and improve the quality score of your ad. Setting out to optimize your Google AdWords can be tricky if your keywords aren't organized efficiently. By organizing your keywords by match type or by top performers you take much of the guesswork out of your conversion rate optimization. You'll no longer need to search through all of your keywords and ad groups to figure out which ones are lowering your click-through-rates and wasting budget. Both methods of ad group organization will have you well on your way to optimizing your AdWords account and maximizing your ROI. How do you organize your ad groups in Google AdWords? What's your favourite method of organization? Weigh in below and let me know!